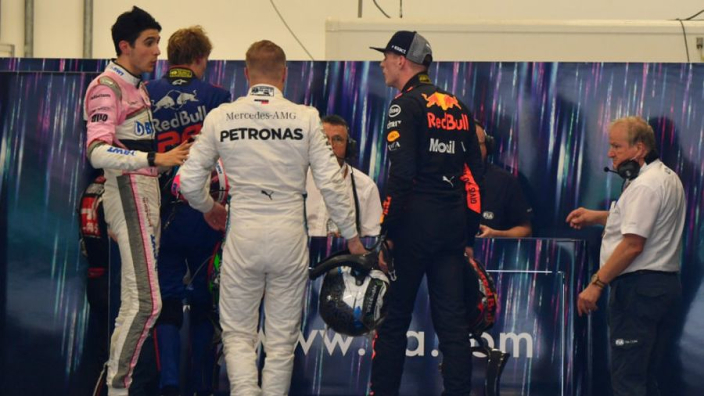 Max Verstappen has revealed that Esteban Ocon laughed at him after being confronted in the aftermath of their Brazilian Grand Prix clash, while adding that the Force India driver shouted "get the cameras" once Verstappen shoved him in the weighing room. Verstappen as cost a near certain victory at Interlagos when Ocon's attempts to unlap himself caused contact between the pair. Lewis Hamilton skirted through the incident to win and deny Verstappen the chance to take consecutive race victories for the first time in his career – having succeeded the previous race in Mexico. Verstappen remains largely unrepentant over his reaction, while details of Ocon's reaction perhaps paints the Red Bull star's actions in a different light. Asked about the incident by AD, Verstappen said: "It was not even the emotions, I thought it was a very calm reaction on my part. "I was told by a lot of people that I should have hit him in his face. And I could just as easily have hit him, but I did not do that. "Then he started to laugh at me a little. And if you just lost that race, I think that is a very inappropriate reaction. "So I pushed him, saying: 'What are you doing?' He immediately started shouting: 'Get the cameras'. And he said: 'Push me, then. Push me'. "I do not care about the cameras. I think that is a very normal reaction."